I live in an extraordinary place! In my last post on the Great Valley I was discussing our use and abuse of our most precious resource, one of the richest soils on the planet. Some 95% of the original ecosystem has been manipulated by humans to achieve the highest biomass production possible. Our burgeoning population has to eat after all, and the amount of arable lands is declining worldwide, not expanding. I also posted a number of photographs that intimated what the Great Valley might have looked like prior to 200 or so years ago when European colonists began twisting the landscape to their desires. The valley must have been a fascinating sight in all seasons! Cedar Waxwing (Bombycilla cedrorum). 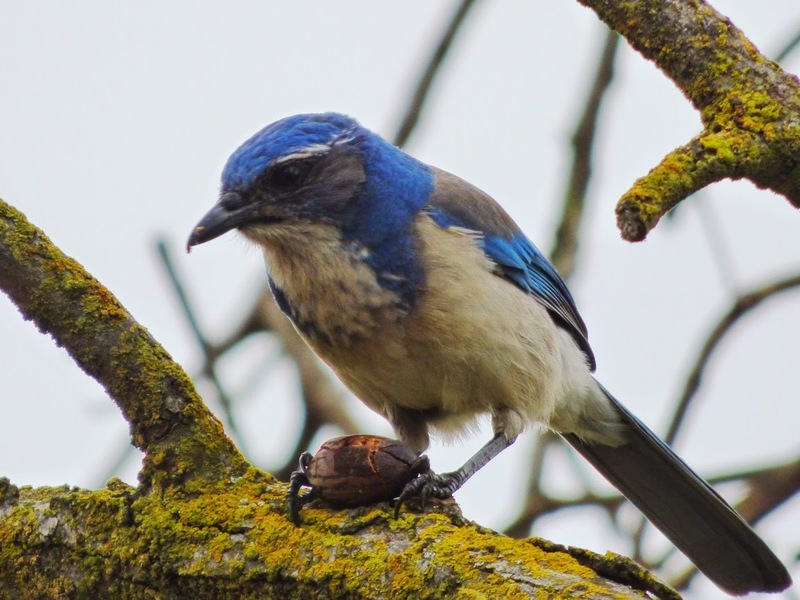 For more pictures of these beautiful birds, check out my post at Geotripper's California Birds. Since arriving home after nearly two weeks of extensive travels, I finally had a chance to get out and check my walking routes, around the pasture near my home, and out by the "mini-wilderness" on the west campus of Modesto Junior College. We also stole a moment from our errands today and watched the sun set at the Beckwith unit of the San Joaquin National Wildlife Refuge, which has a viewing platform just eight miles west of town. 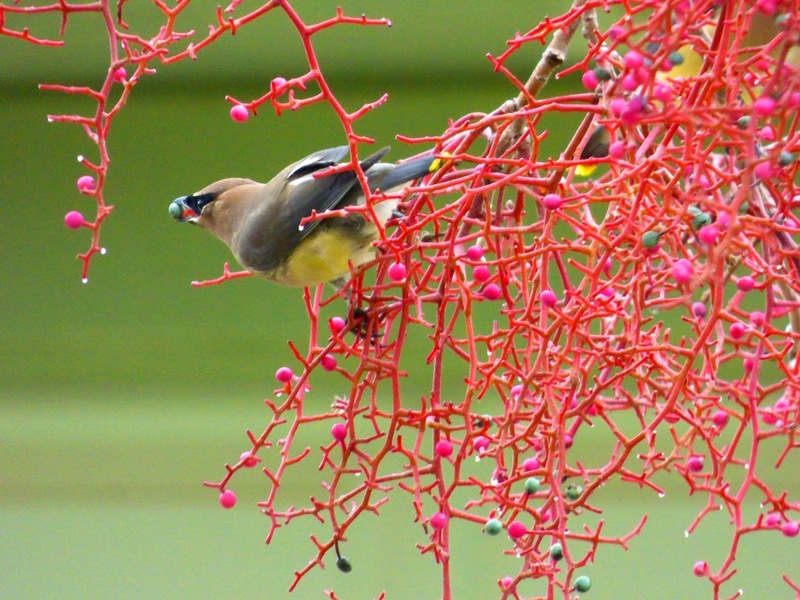 There had been a lot of changes in the two weeks as a number of migrant species had arrived, including especially the Cedar Waxwings (above). Nuttall's Woodpecker (Picoides nuttallii), a California endemic species. Walking through my normal haunts, I was struck once more with a realization about the scarred and embattled ecosystem I live in. There are survivors of the apocalypse still living among us. Like a war zone, there are vast areas of destruction, and little enclaves where the native species still hang on. Sometimes it is in stretches of woodland along rivers where the ground was too uneven to plow. In other instances, the alien invaders happened to plant ornamental trees that produce just enough berries or fruits that the natives can thrive. In a few precious localities, the alien invaders set aside larger environments from abandoned farmlands (partly so they could hunt the natives species, but that's the Faustian bargain that had to be made). In any case, the walks and observations this week for some reason included no Pigeons, Starlings, or House Sparrows, all of whom are opportunistic alien species. The birds I saw were the native species that had found a way to survive in this new alien world. 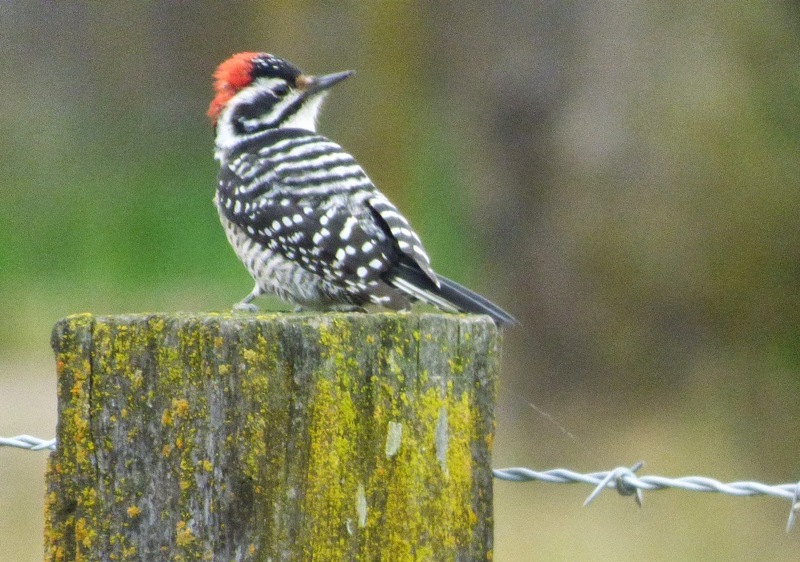 There was a Nuttall's Woodpecker, a California endemic (when one includes a portion of Baja California, anyway). It was hunting for insects on fenceposts instead of trees. Yellow-billed Magpie (Pica nuttalli): More on this California endemic can be seen in this post. 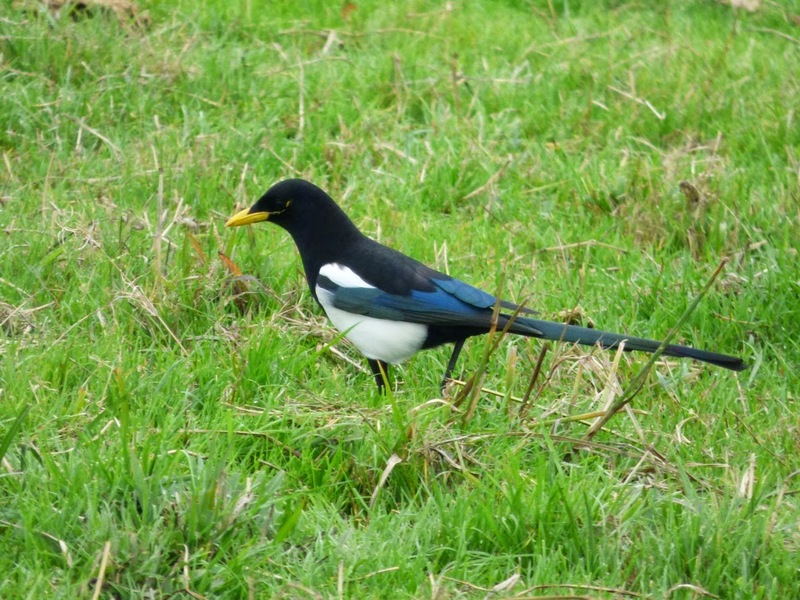 There was a small flock of Yellow-billed Magpies in the pasture. These striking birds are a wholly Californian endemic species, found only in our Great Valley. They were almost wiped out by the West Nile virus, but they are slowly making a comeback. 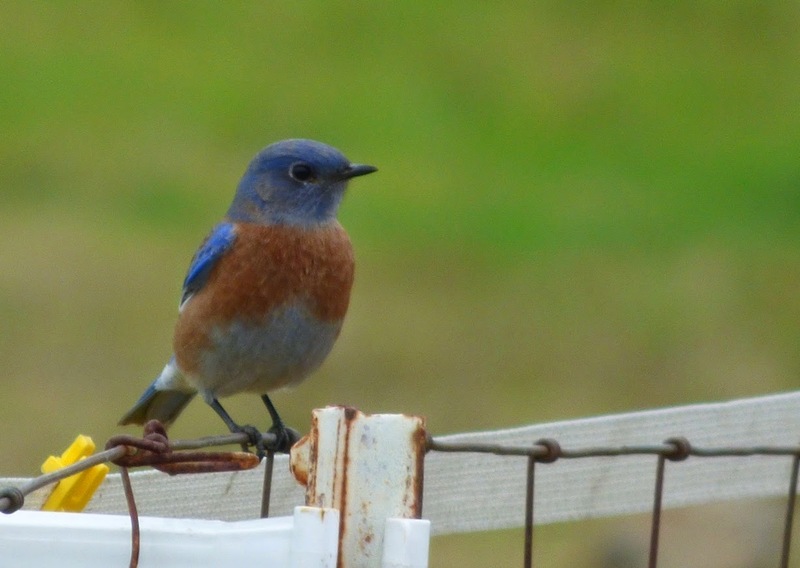 I see the Western Bluebirds on occasion throughout the winter and spring. I think they migrate up into the Sierra Nevada during the summer. Oak Titmouse (Baeolophus inornatus) on a west campus oak tree. 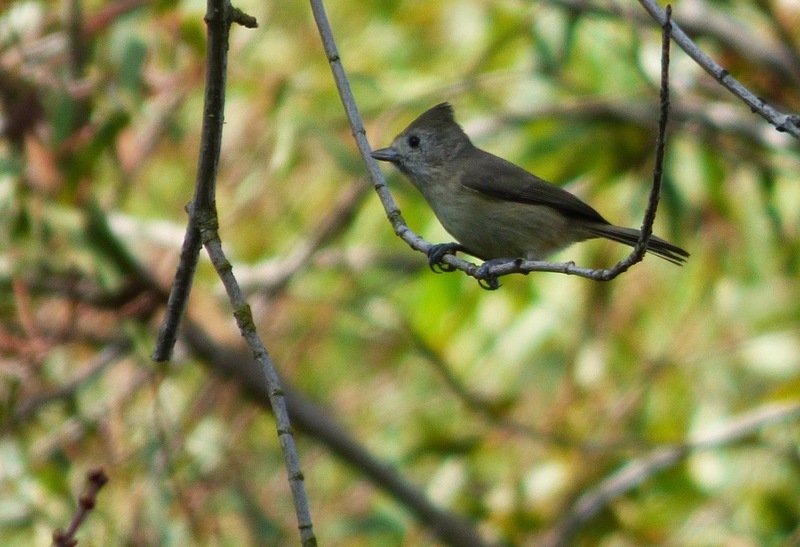 Another more-or-less California endemic is the Oak Titmouse (Baeolophus inornatus). It ranges a little into Baja California and Oregon. The acre or so of oak trees in the "mini-wilderness" provides them a bit of valley habitat in our area. 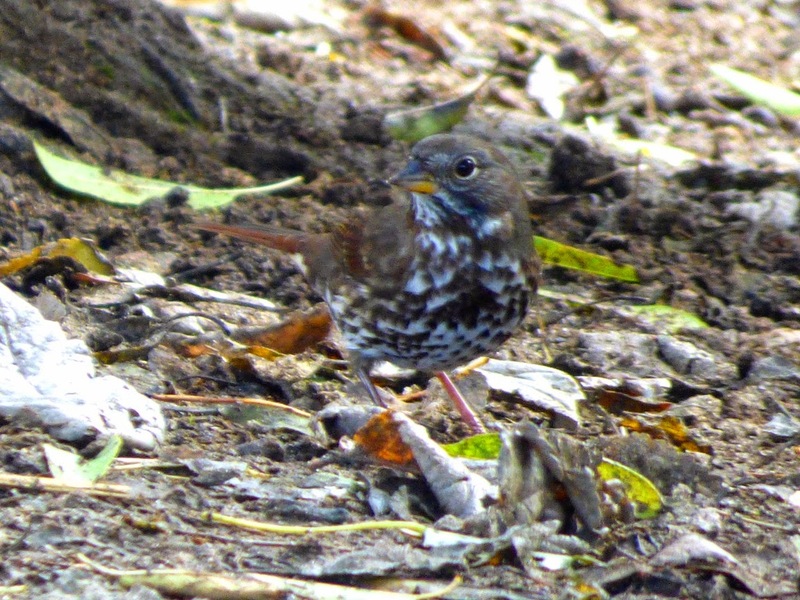 Finally, there is a Sooty Fox Sparrow (Passerella iliaca unalaschcensis) that I discovered Tuesday on the west campus of my school. I'm new at this birding business and so was not used to searching the leaf litter for what I always thought were House Sparrows. The Sooty is one of four subspecies of Fox Sparrows. The number and variety of American sparrows is incredible, and is a startling picture of ongoing evolution in action. It's inspiring to find that some hint or echo of the Great Valley's natural heritage still survives here and there, especially when it is a short walking distance from home or work. More than anywhere else, though, the glory of the ancient days still lives on in the federal bird refuges that line our valley like a string of pearls. Last night we saw a sky filled with migratory birds, thousands of them, who still have a winter home on part of the valley floor (see the video at the top of the post). These are places that should be protected and cherished, and not criticized because they take up some of the water in these hard drought years. Although I understand farmer resentment in such situations, the total water devoted to wildlife survival is no doubt a small percentage of the total utilized, and I'd rather see a healthy population of native birds over an additional field of cabbage or corn. mmmh. time for some bird habitat research.